Councils and their waste contractors are a vital part of the container glass recycling machine. From kerbside and public place collection to transfer stations, the work they do and the infrastructure they use for container glass recovery makes a big difference. Councils are also very keen to improve their waste minimisation targets, and with glass being highly recyclable it is a waste stream they are keen to tackle. Working with councils to improve the quality and quantity of glass to be recycled is therefore an important part of the Glass Packaging Forum’s activities. 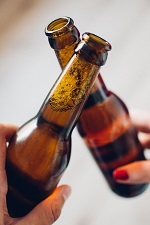 We have recently worked closely with Tauranga City Council to help address their container glass collection issues and have approved funding applications for four other councils. We also continue to connect with other sectors of the container glass supply chain in an effort to improve the quality and quantity of glass being recycled. Tauranga is a region which has been working hard to improve its container glass collections, with the Forum approving two grants there, one of which is the biggest ever made. 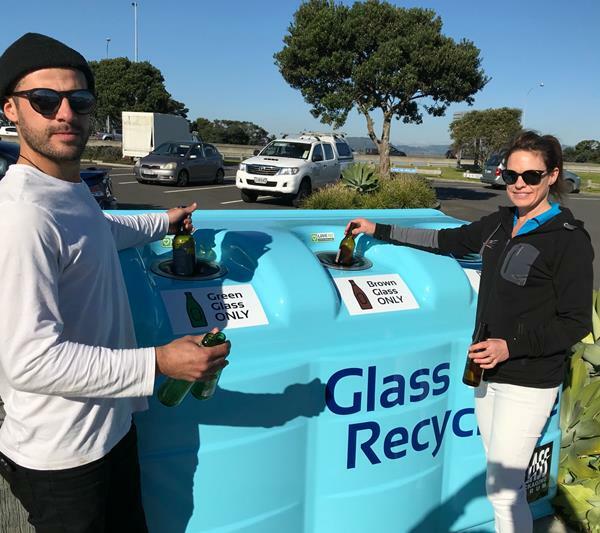 The Forum has contributed $165,000 to cover around a quarter of the total cost for the Tauranga City Council to introduce a new, kerbside collection service for container glass. The interim, rates-funded service will see each household issued with a container specifically for glass collection, ensuring it is kept apart from other recyclables. The service is expected to be introduced in October to address the loss of kerbside container glass collections which occurred in March. The Tauranga Bridge Marina has also benefited from a Forum grant, for $15,600, making it possible for five bottle banks to be placed there early this month. The bottle banks mean recycling glass is quick and easy for boaties and marina staff, and also ensures the bottles and jars are colour-separated at source. The first of the Forum’s new funding rounds was a great success, with nine applications collectively worth $114,000 coming in over the course of the application period in May. Waitaki Resource Recovery Trust – to improve the loading of bulk glass and associated noise control ($3,726). Devonport Community Recycling Centre – Global Action Plan Oceania (GAPO) – for a 30m3 hook bin for increased glass diversion and operational efficiency ($20,500). Upper Hutt City Council – to extend an existing recycling facility with a purpose-built glass container ($10,000). Tasman District Council – to improve the Mariri Resource Recovery Centre capacity ($20,000). Taupo District Council – to improve glass recycling at Kinloch Refuse Transfer Station ($22,000). Tararua District Council – to help the roll out of a glass recycling drop-off system through the district ($13,860). If you missed out on putting an application through during our last funding round be sure to get it in when the next round opens in September. The application period will run from 1 to 30 September. If you have a project which will improve the quality and quantity of container glass going for recycling, then we want to hear from you. The Forum has given more than $2 million in funding to date. Projects for alternative outcomes for container glass that can't be returned to the furnace should also be submitted. While we work closely with councils, recycling companies and community groups, the Forum is also always looking at reaching other sectors of the container glass supply chain. Whether it be attending conferences such as the upcoming Hospitality NZ Conference, NZ Beverage Council Conference or New Zealand Winegrowers Romeo Bragato Conference. We want to connect with those in the world of glass bottles and jars. 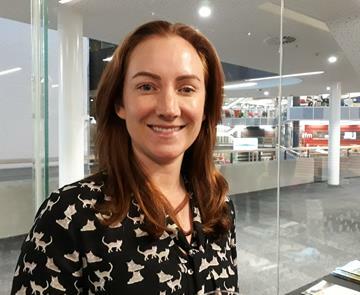 The Glass Packaging Forum Steering Group for 2018-2019 has been selected with Rob Langford (Pernod Ricard), Alistair Sayers (Frucor Suntory), Penny Garland (O-I NZ), Don Chittock (Fulton Hogan), Kat McDonald (Lion), Amber McEwen (DB Breweries) and Neil Waka (Coca Cola Amatil) taking on the task. This sees the departure of Doug Banks (DB Breweries) and David Meads (Lion). Doug has given over five years to the Steering Group, while David has dedicated just under two. Both have been invaluable and we thank them for the work they have done to further glass stewardship in New Zealand. 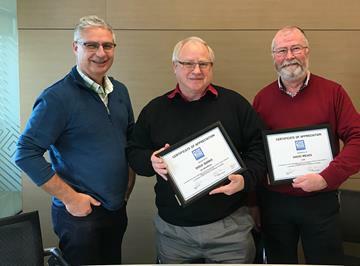 GPF Steering Committee Chair Rob Langford, left, with outgoing committee members Doug Banks and David Mead. Lion Sustainability Manager Kat McDonald is a new GPF Steering Committee member. New GPF Steering Committee member, DB Breweries Director, Corporate Affairs Amber McEwen. We all know that business customers and consumers are demanding better environmental outcomes for the products and packaging they buy. Your membership of the Forum demonstrates your commitment to achieving good outcomes for this infinitely recyclable packaging, and to improving sustainability for your business. We'd encourage you to celebrate your part in this positive environmental story at any events or trade shows you might attend, on your website or when promoting your products. Know anyone who should be a member of the Forum but isn't? Greater numbers strengthen our stewardship scheme, give the Forum a stronger mandate and help build more robust partnerships. All this results in more glass back to the furnace. Please encourage others to join you in membership of the scheme, supporting good outcomes for container glass. Talk to us about how we can work together to improve outcomes for glass. We can help! You're receiving this because you are on the Glass Packaging Forum or 3R Group database.